I’ve been receiving questions regarding when to spray for bagworms. Bagworms overwinter as eggs in these up to 2″ bags which are formed throughout the summer with silk and evergreen needles by larvae. Larvae feed until late August or early September. Males then emerge and mate with females through the bag opening in September. 500-1000 eggs are deposited by female moths within their own bags. After depositing eggs, the females drop to the soil and die. 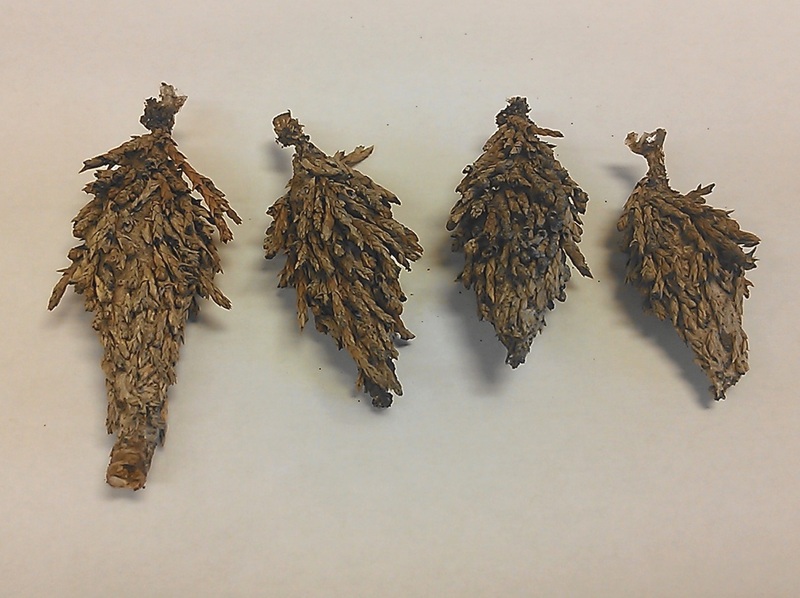 Bagworms overwinter as eggs within bags fastened to twigs such as these shown in this photo. Eggs hatch in mid-May to early June. Some caterpillar larvae remain on the same trees containing the bags from which they hatched. 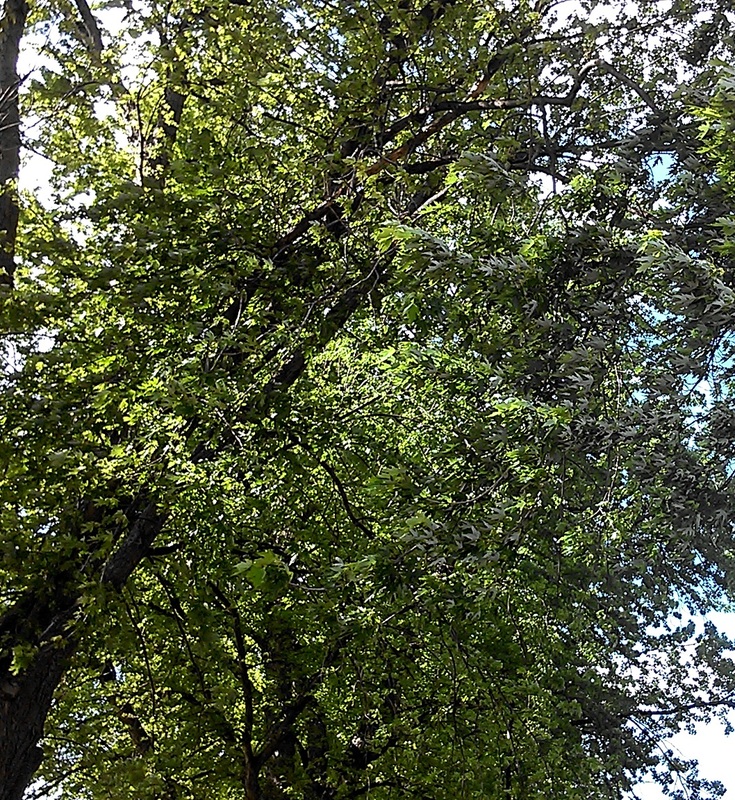 Others are blown by the wind to area trees allowing for new infestations to occur. This photo shows new bags (1/8-1/4″) being formed on trees as they create these bags around themselves. Look closely for these tiny bags on trees right now. The video below shows how to look for bagworms on evergreen trees right now. Study your trees and look for small movements on small bags being formed. 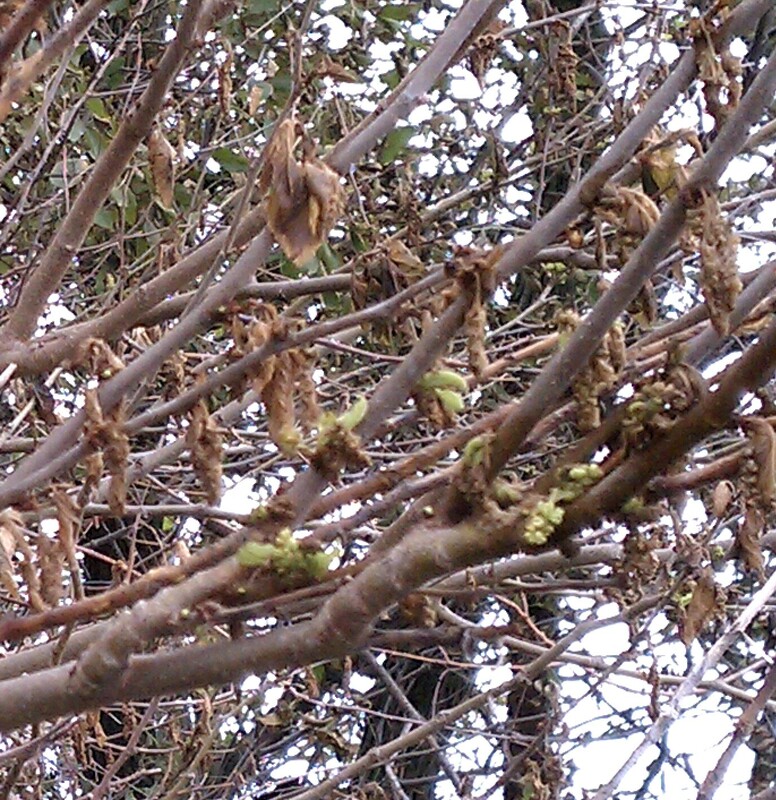 If you are seeing this, consider treating your trees for bagworms. Products containing bifenthrin or permethrin irritate caterpillar larvae causing them to come out of the bags and be exposed to the pesticide. There are a number of other management options available. Please see the following publication for more information. 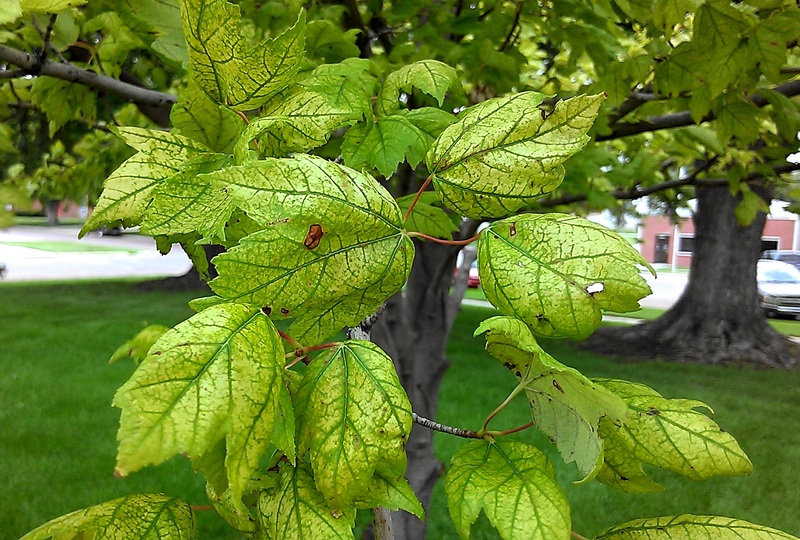 Throughout the County, iron chlorosis is appearing in trees and landscapes. It can especially be seen in the silver maples (shown in this photo) and pin oaks. Iron chlorosis symptoms appear as yellowing of leaves while the leaf veins remain a dark green color. Eventually the leaves become so chlorotic that leaf tissue begins to turn brown/black and die. Severely affected leaves often drop from the tree and new leaves emerge in 7-14 days. Alkaline soils (pH above 7) reduce the availability of iron and manganese; two important nutrients found in tree leaves. It’s not necessarily that these nutrients are deficient in the soil. The high pH just makes these nutrients less soluble and unavailable to the trees. Adding iron to the trees or the landscape around the trees won’t correct the problem as the pH ultimately needs to be corrected. Early in my Extension career, I inherited the job of injecting trees with a solution of iron sulfate. There would often be a waiting list of people to help, particularly in Sutton, when they’d see the jugs hanging from trees. As a plant pathologist, I was concerned about how much damage we were doing to the trees with repeated injections every five years or so…if secondary pathogens would affect these areas we were drilling in the trees. I was also concerned about providing a free service that took a great deal of time and if we were competing with industry by doing so. Eventually we stopped providing the service but we do rent out the equipment and can provide the recommendations on how much iron sulfate to add based on tree diameter if you are interested. But you may be interested in another less invasive method instead. I learned of another potential method to consider from John Fech, Extension Educator in Douglass/Sarpy Counties, and we tried it at the Sutton Cemetery for two years and at the Clay County Courthouse last year with decent results. The first step is to double aerate the area from the trunk to the dripline of the trees showing iron chlorosis symptoms. The dripline is the outer leaves of tree. Do so several days after irrigation/rainfall to avoid tearing up the grass in your lawn. Often people aerate their lawn in the spring and/or fall, so if you have a problem with iron chlorosis, you could include the following treatment into your routine. The second step is to broadcast spread granular sulfur on the soil surface. Then broadcast spread iron sulfate on the soil surface. What was recommended to us by Omaha Master Gardeners was using 3 lbs of sulfur + 3 lbs of iron sulfate for “small” or newly established trees; 4 lbs of sulfur + 4 lbs of iron sulfate for “medium” sized trees; and 5 lbs of sulfur + 5 lbs of iron sulfate for “large” established trees. I realize that’s not very scientific based on sizes so do the best estimation of tree size that you have. We used 5 lbs for everything at the cemetery and courthouse. Here Mike, Clay County Courthouse Custodian, is spreading the product close to the trunk first. He continued applying around the tree in a circle gradually moving out towards the drip line. The final step is to then water the lawn. 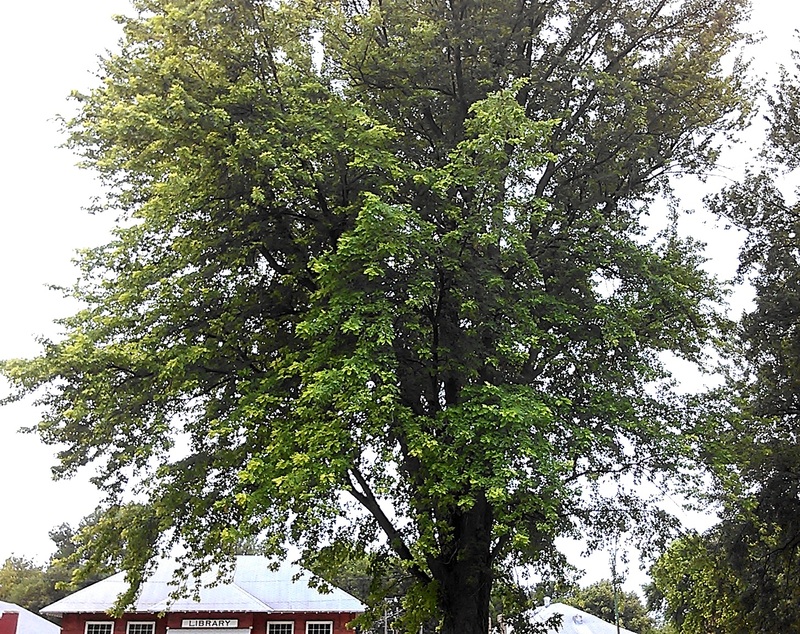 We have numerous silver maples at the courthouse. This is a photo of one of the trees and a close up of these leaves was shown in the first photo. You can see the yellow cast to this tree in this photo and how severely affected many of the leaves were from the first photo. This is the same tree a year later from the opposite side. The photo doesn’t do it justice as it truly is greener than last year and the leaves are hailed damaged. It didn’t really change during the season last year but all the courthouse trees are greener this year. They could use another application though as they still show symptoms of iron chlorosis. This method may take several years before the soil pH changes enough for symptoms to disappear. You most likely will not see any changes the first year, although the grass under the tree may appear greener. The goal is to change the soil pH to make the iron more available to the tree in the future. This may be a process that needs repeated for several years in a row and while it doesn’t show instantaneous results, it will most likely aid in the longevity of your trees by reducing the symptoms without additional harm to the tree through injections. 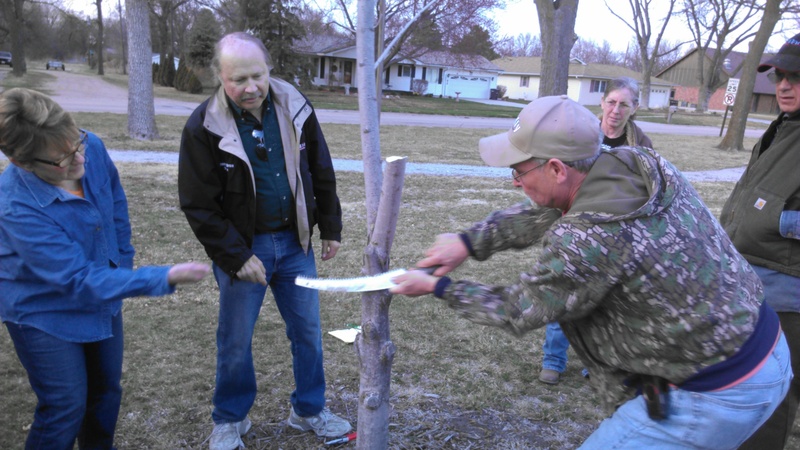 Special thanks to Dr. Scott Dewald for the wonderful evening of information he provided at our tree care workshop last week! 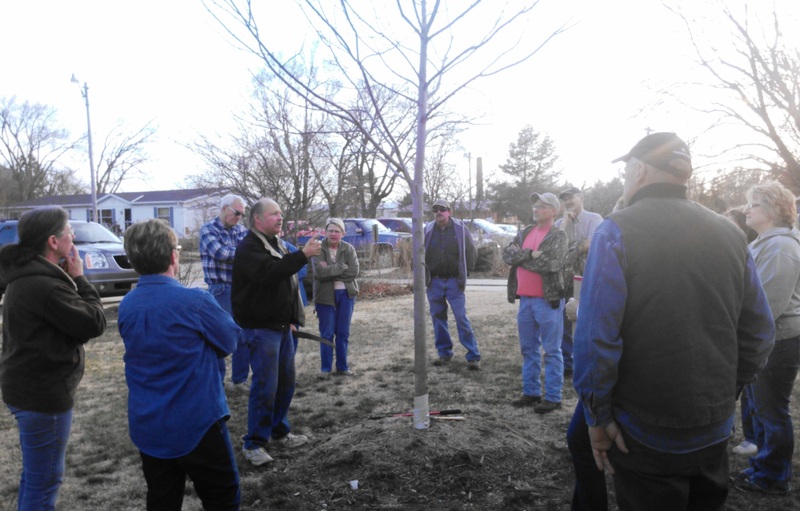 Scott Dewald explaining what to look for when considering pruning a tree. 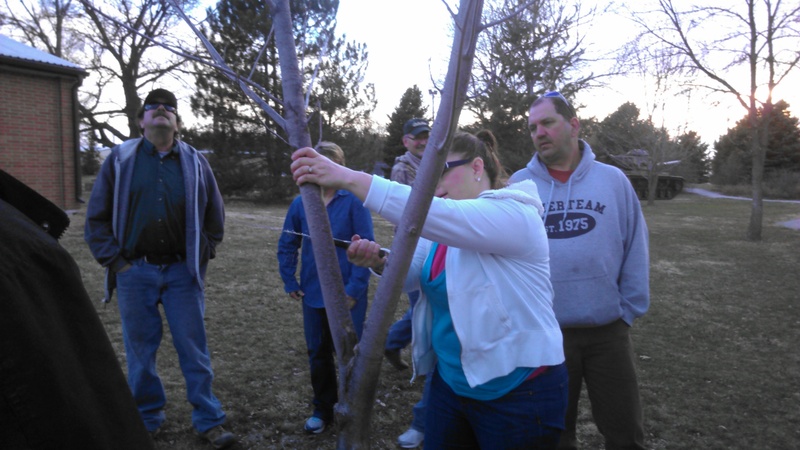 Scott shared that one should never prune more than 1/3 the height of a tree in one season. Pruning should also be done to obtain a main leader and overall structure. It’s also best not to prune limbs more than 2″ in diameter. If the limb needs to be pruned but it encompasses more than 1/3 of the limit of what should be removed in a season, one could “head” the limb by removing a portion of it one year and then complete the cut the following year. This will slow the growth of that limb. 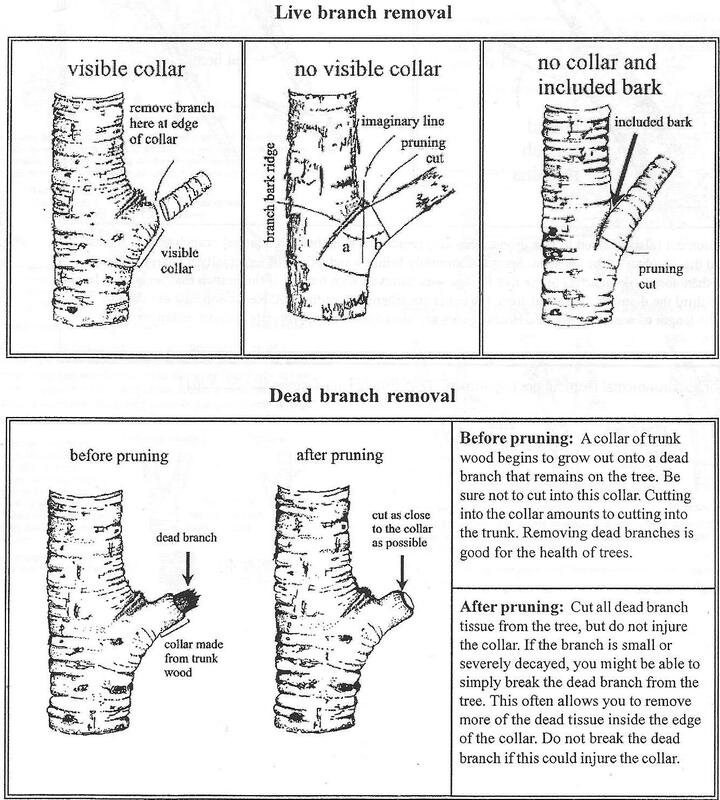 Pruning cuts should always be made at the “bark collar ridge” which produces a round cut and allows the tree to naturally heal. 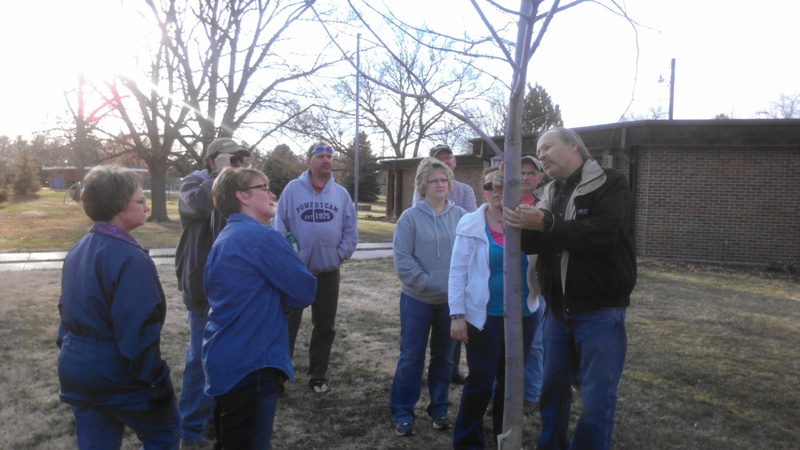 Scott shows attendees where the bark collar ridge is on this branch. Pruning Fact Sheet ENH847 from University of Florida Extension written by Edward Gilman with good visuals of where proper pruning cuts should occur. We learned that on large branches, it’s good to make a cut farther out to remove the weight first, and then go back and make the proper cut at the bark collar ridge. Improper pruning can result in further damage to the tree. Here we were trying to correct this tree for not having a main leader. Typically one would leave the southern-most branch according to Scott, but in this case, the northern-most branch was stronger. Scott said there was no need to stake the tree or try to get the northern-most branch to straighten out as it would naturally do this in time on its own. After a large part of the branch weight has been removed, this attendee is now making the proper cut at the bark collar ridge. We also walked from tree to tree in the park looking at additional problems. I noticed how high the mulch was piled on some of the trees. 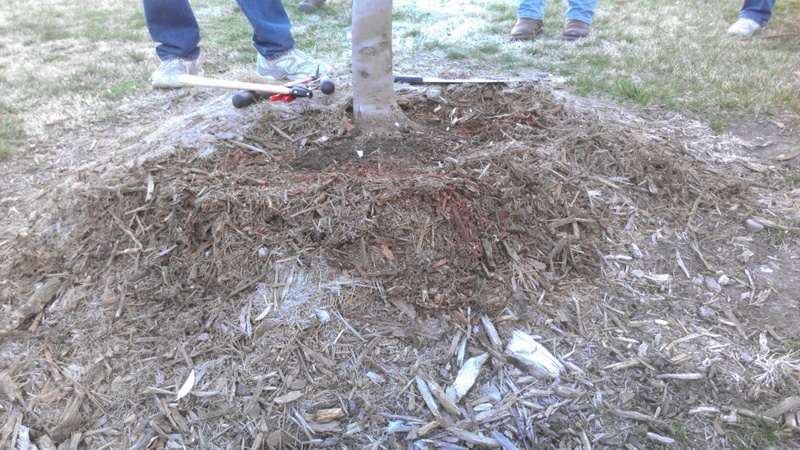 Mulch should never be placed against the base of the tree as it can cause rot. But in this case, it was observed that the person who planted the tree did not dig a deep enough hole. What appeared to be a pile of mulch was the actual root ball and soil mounded up above ground. This situation also most likely was a result of improper planting. 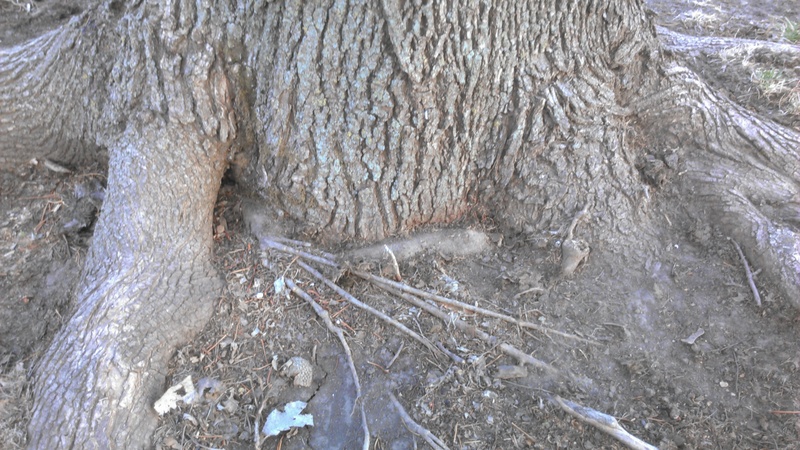 In this case, the tree roots began wrapping around the base of the tree girdling it (like choking it). This is the most common problem I see with tree calls. A huge enemy to trees are weed whackers! 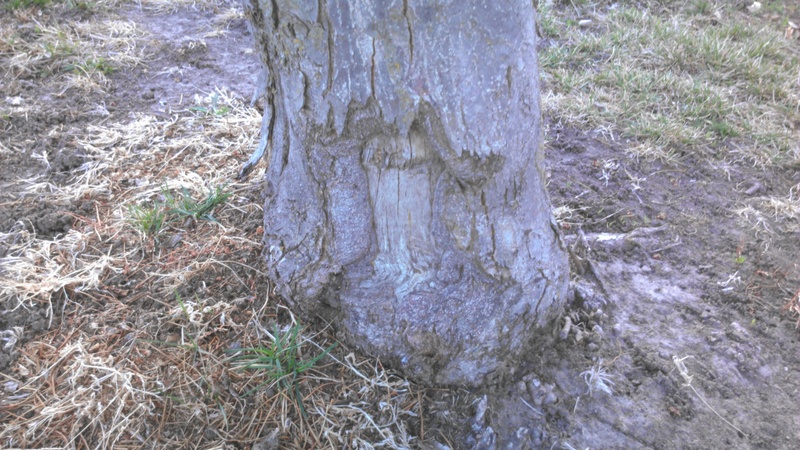 In this case, you can see extensive damage to the bark and the base of this tree. Depending on the damage and how well the tree can seal the wound will depend on if the tree will survive or not. Often, as in the case of this tree, the tree will be weakened with few leaves appearing on branches. 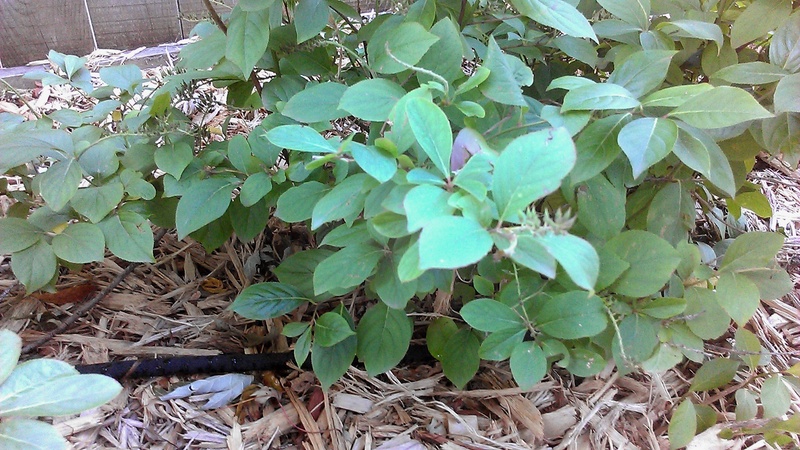 It’s best to place mulch around trees in order to avoid having to use weed whackers on them-but again, don’t place the mulch up against the base of the tree! This was a fun workshop for me with the right size of group and great hands-on demonstration where we also learned from pruning mistakes and how best to correct them. Thanks again Scott! In the landscape, October is the month to water, control weeds, and plant bulbs, trees and shrubs. It is also the month to wait until after a freeze to cut back perennial plants and wait for the soil to freeze before covering tender plants with winter mulch. Kelly Feehan, UNL Extension Educator, provides the following information. Sometimes people ask if trees and shrubs should be watered at this time of year since their leaves will soon drop off; and how late in the season lawns should be watered. As long as the soil is dry, go ahead and water. Plant roots continue to grow long after leaves drop off trees and shrubs and after grass stops growing. Roots, rhizomes and stolons can grow well into November and fall watering promotes this growth helping plants recover from summer stresses. Plant energy can be used for root growth during fall since energy is no longer needed for leaves, flowering or seed production. Roots continue to grow until soil temperatures drop below 40 degrees Fahrenheit with available moisture. Water enough to moisten the soil to a depth of about eight to twelve inches for trees and shrubs and six inches for lawns. Keep in mind that a lack of oxygen due to a saturated soil is just as damaging to roots as a lack of water. Allow the soil to dry between watering. Because roots continue to grow well into fall, September through October is a good time to plant deciduous trees and shrubs. 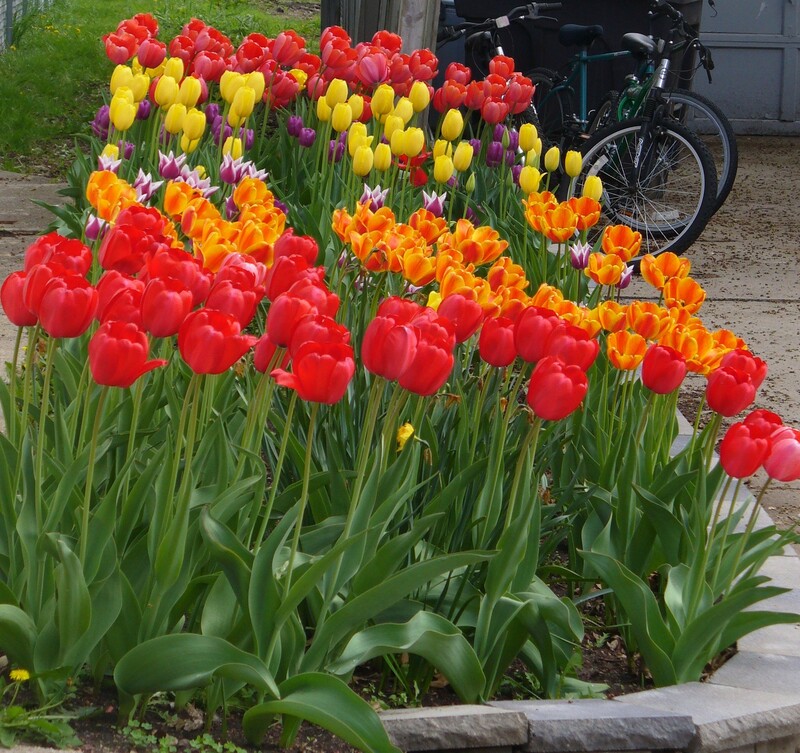 For spring flowering bulbs, wait until soil temperatures drop to 60 degrees Fahrenheit to plant. A common question asked about fall planting is if a starter fertilizer needs to be used at planting time. Starter fertilizers are high in phosphorous, a nutrient important to root production. The only way to know the answer to this question is to have a soil test taken. However, most landscape soils are high in phosphorous (P). Fall soils are often warm and dry which makes P more readily available. In most cases a starter fertilizer does not need to be used during fall planting. More important is to plant at the correct depth. With bulbs, follow label directions for planting depth. It varies depending on bulb size. 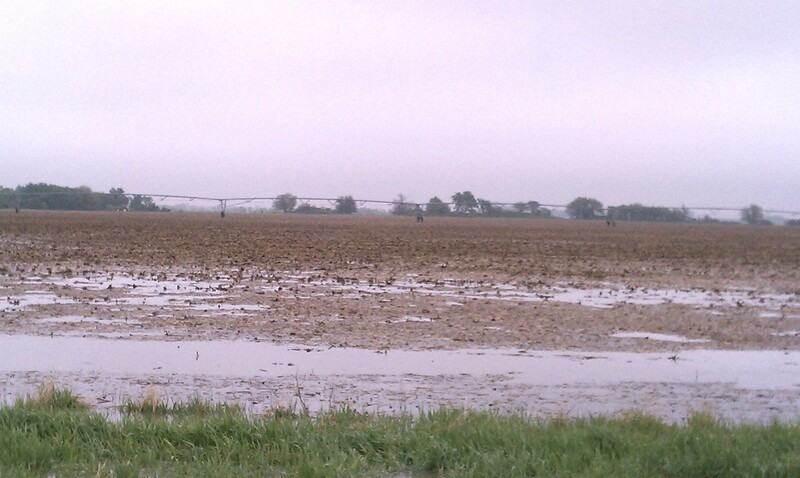 Some recommendations say to plant about one to two inches deeper than recommended. The opposite is true for trees and shrubs. Before planting trees, locate where the trunk flares out at the trunk base then plant at a depth so the flare is visible above ground. Do not loosen the soil beneath the root ball or the tree may settle and end up planted too deep. In heavier clay soils plant so the trunk taper is one to two inches above the ground. October is the best time to control perennial broadleaf weeds like dandelions, ground ivy and clover. There is no ideal time during fall to apply lawn weed and feed products together. 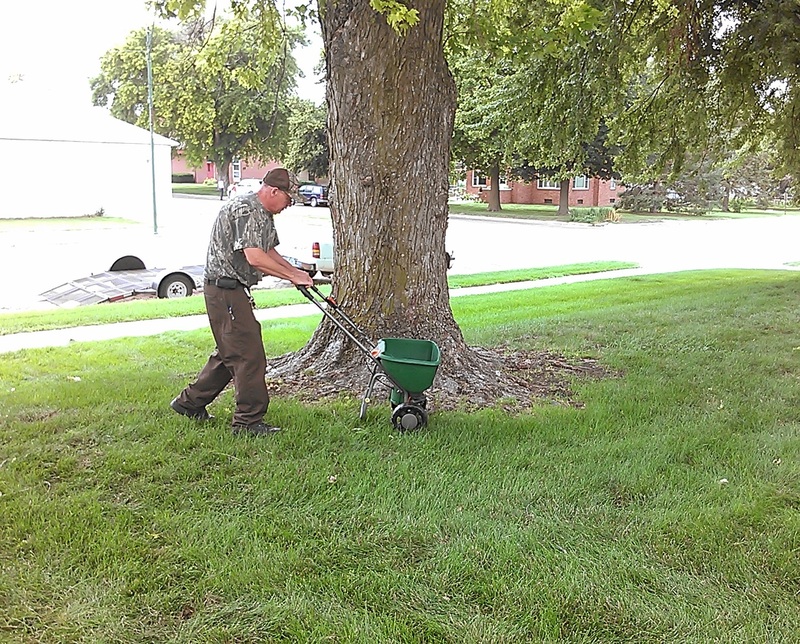 The best time to fall fertilize lawns is in early September and again in late October or early November. 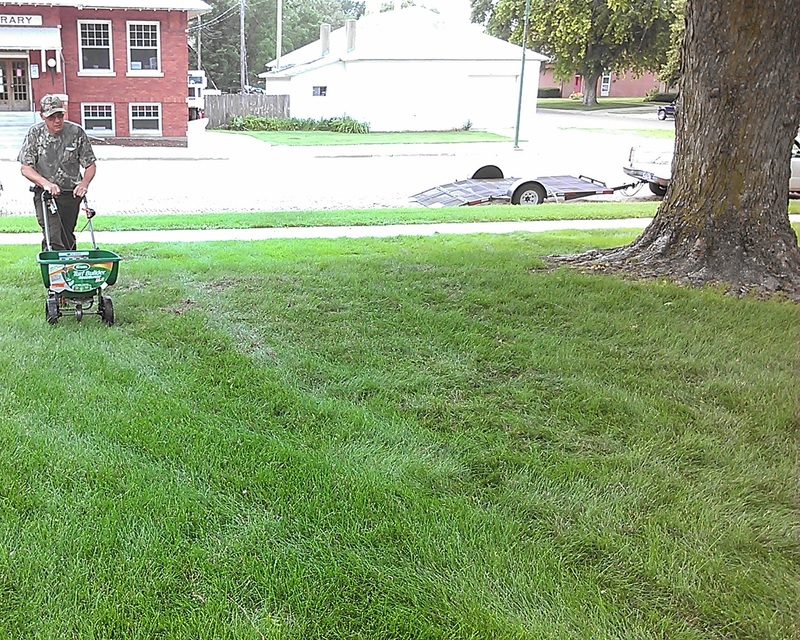 The best time to apply herbicides for lawn weeds is about mid-October before a hard freeze. Weed control can be more effective and less herbicide will be applied where it is not needed by avoiding the use of combined weed and feed products during fall. One can achieve better weed coverage and control of established broadleaf weeds if the weeds are spot treated, typically with a liquid formulation of herbicide. Here’s wishing you a great October of accomplishing landscaping projects! Somehow April flew by without me reminding you to apply fungicide sprays to Austrian and Ponderosa pines that have had problems with Sphaeropsis tip blight in the past. I’ve also received several scotch pine samples in the office to diagnose for pine wilt nematode. While there is no cure for pine wilt, I recommend to take a 6” long, 1-2” diameter sample of a dead branch to your local Extension office for diagnosis before cutting down the tree. Pine wilt affects Austrian (long needles groups of 2) and Scotch pines (short needles in groups of 2) as they are non-native trees while the nematode is native. Since ponderosa pines (long needles in groups of 2 and 3) are native to Nebraska, they don’t seem to be affected by pine wilt nematode. Pine wilt is caused by beetles carrying pine wood nematodes vomiting them into the water-carrying vessels of the tree (xylem). The tree senses the nematodes and essentially blocks water to those branches. Often you will observe a branch then perhaps a side of the tree and eventually complete death of the tree within 6-9 months. 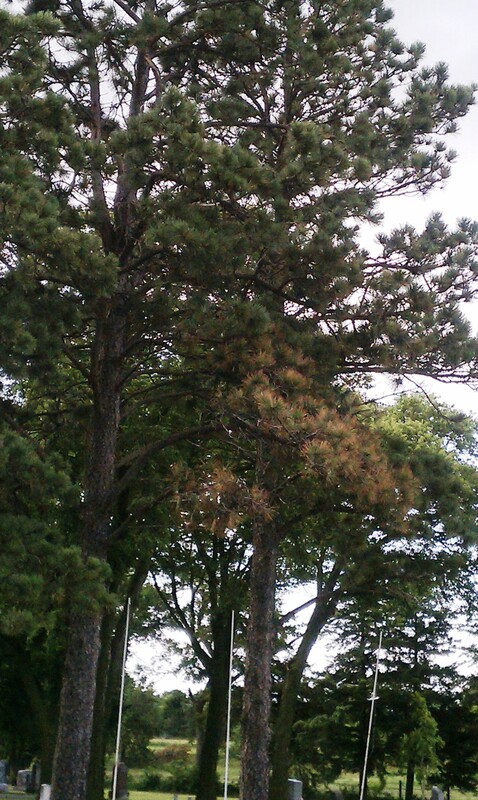 While I have diagnosed many samples of pine wilt, more often when I visit homeowners the tree problems are due to fungal diseases which occur on the needles. If you look closely at your needles and observe dark bands or rings on them followed by death of the needle either direction from the band, the tree problem is most likely due to a fungal needle blight like dothistroma in Austrian and Ponderosa pines or brown spot in Scotch pines. They can all be prevented by spraying a fungicide containing copper sulfate in the spring. With everything about 3 weeks early this year, now is the time to spray Ponderosa and Austrian pines for needle blight and spruce trees that have had problems with needle cast or shoot blight where the new growth has died in the past. 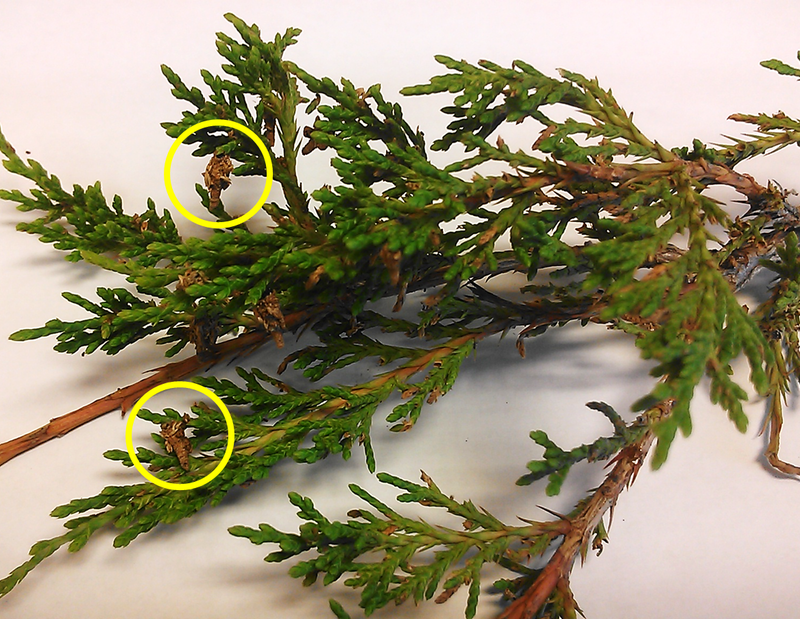 In early June spray for needle blight problems in Scotch pine and cercospora blight on cedars. If you have a windbreak of combinations of these trees and don’t want to spray twice, I recommend at least spraying in early June to catch all of them. Increasing air flow by cutting out some trees is another way to reduce fungal diseases on your trees. Also watch trees for bagworms as you may be able to tank mix a fungicide/insecticide application in early June if needed. We would recommend picking the bags off trees and burning them, but that’s just not feasible in windbreak situations. To know when to spray, take a few of the bags off the tree, place them into a plastic ziplock bag, and place outside on the south side of your house. When the larvae emerge from the bags, check your trees to see if larvae can also be observed on them. Pyrethroid insecticides are recommended for managing bagworms because they cause an irritation that makes the larvae leave the bags and allow them to be exposed to the pesticide.